Tanya was flying to Europe to meet her family in Portugal in mid-September, 2014, so rather than sit around getting bored I thought, “Why not Hawaii?” There are four climbs in Summerson’s book that I wanted to do and this seemed like a good opportunity. But I have mixed feelings about traveling alone. I don’t really enjoy traveling alone, but suffer it for the sake of reaching goals such as hiking via ferratas – or riding up volcanoes in Hawaii. When I look back, I remember the hiking and cycling and forget the loneliness, but at the time I long to be with friends. So it was in Hawaii. 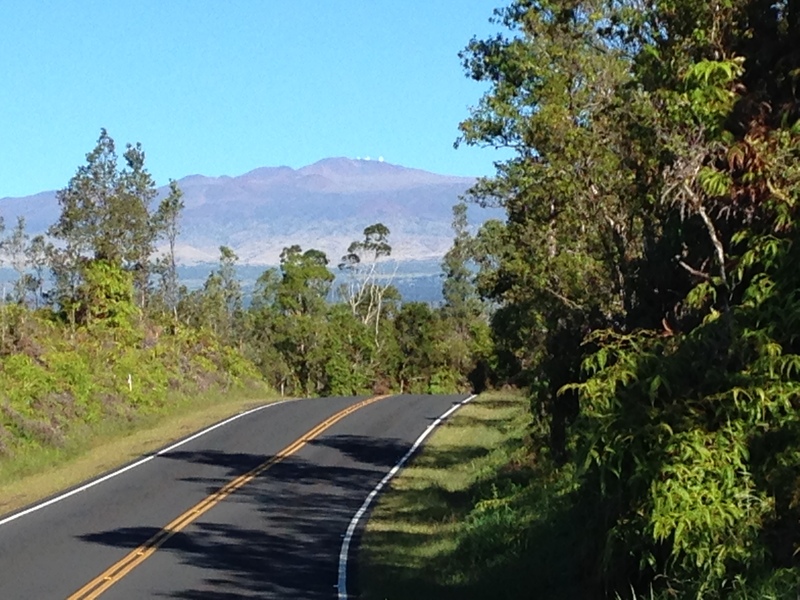 There are three big climbs up volcanoes in Hawaii – Haleakala on Maui, and Mauna Loa and Mauna Kea on the Big Island. They are classically ridden from the sea – from Paia on Maui and Hilo on the big island. The mountains are massive but gradual; they don’t even look like real mountains, and you’d never confuse them with the Rockies or the Alps. From a distance they just look like easy hills, rides that shouldn’t take too long or be too hard. But it’s deceptive because they are so big and so far away. I packed my Ritchey Breakaway, drove to Los Angeles, flew to Maui, and stayed at an Airbnb on Naapomukeawunaholuapalumo Road in the town of Paia, the start of the listed climb up Haleakala. Paia is a lovely little tourist town on a lovely little tourist island. And yes, I made up the name of the road. Most of the street names in Hawaii look like that to me. They use all the vowels but only a few consonants – H, K, L, M, N, P, W – and the names look so similar to each other that I could never remember them. I ended up using Google Maps on my iPhone to get everywhere. It gets very windy later in the day so it’s best to start early while things are still calm and the mountain is hopefully cloud free. The start of the ride is very pleasant, along a quiet road past fields of sugarcane. 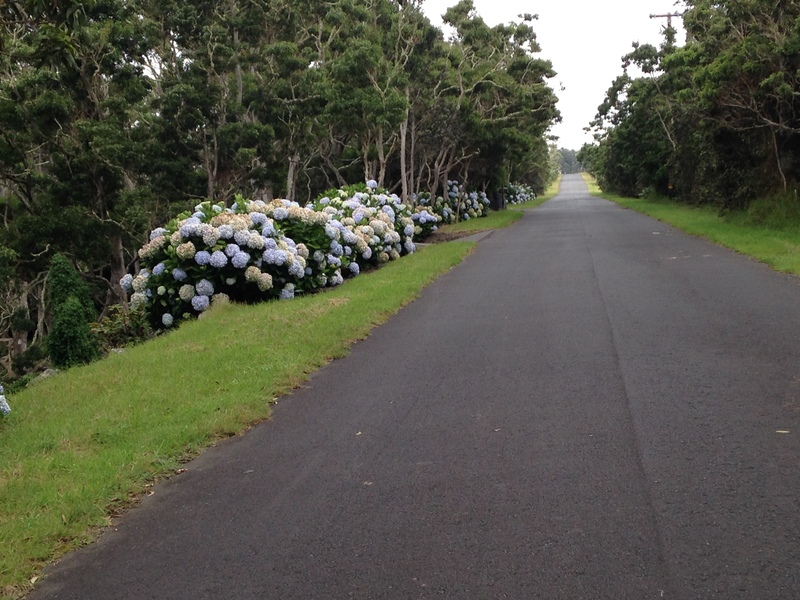 It was a lovely day when I rode Haleakala and the first 14 miles are varied and interesting. At around mile 14 things change. 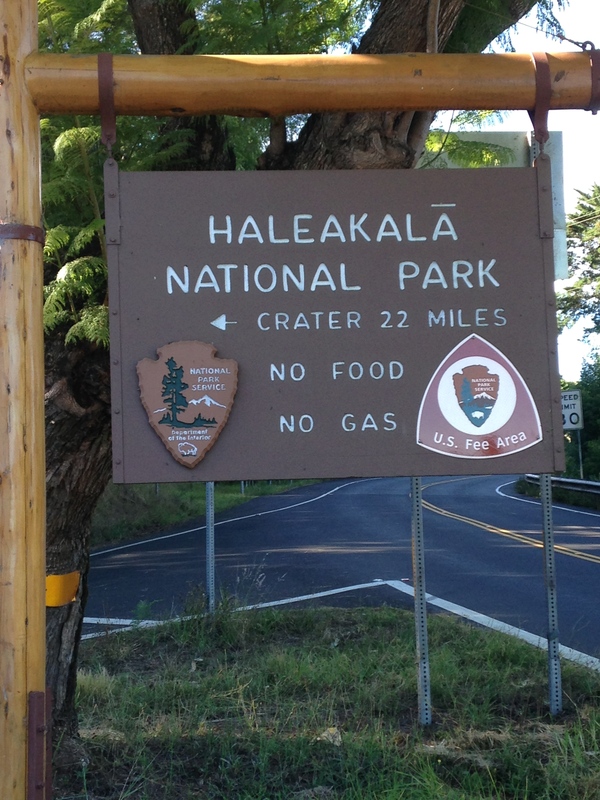 You turn left off Highway 377 onto Highway 378, which is the switchback road up Haleakala. You could logically start the climb here for a brilliant 22 miles of uphill riding, except the tradition is to start at the sea. But this feels like the start of the real climb – the preceding miles were just getting you ready for this – and with 22 miles of switchbacks you slowly make your way up the mountain. The road surface is lovely and there are wide cycling lanes on both sides. You understand why when you encounter the large herds of people, dressed warmly, riding their rented bicycles down the mountain, followed by the van that carried them to the top. A few cars go past, but it felt remarkably un-busy. Eventually, a few hours after starting, I reached the top at just over 10,000 feet. I’d brought a rain jacket, arm warmers, knee warmers, and long-fingered gloves with me as I’d read how cold it can be up there, but it was sunny and I used none of those clothes on the way up. Haleakala is often shrouded in clouds and it’s recommended that you plan on being on Maui at least two days if you want to ride Haleakala. I’d only given myself one day on Maui, and luck was with me. I met another cyclist at the top and we took a few photos of each other, then I headed down. I wore my rain jacket and long fingered gloves on the way down because although we were cloudless at the top, there was a band of clouds around the mountain about half way down. Sure enough, my fingers were numb by the time I reached the base of the cloud bank and was again in the sun. Eventually everything warmed up and I took off the jacket and gloves and by the time I reached Paia it was hot and the wind was blowing hard. I packed my Breakaway, getting ready to fly to the big island the following day. What a day! I loved this climb. Good weather, wonderful climbing, amazing views from the top. The two big volcanoes on the big island are Mauna Kea and Mauna Loa. You approach them both the same way – up Saddle Road. At one time this was a very poor road and rental car companies didn’t allow you to take their cars over it. Now the upper part is a beautiful wide fast road, with relatively few cars. I thought I’d be riding the two volcanoes on different days, and I drove up Saddle Road to stash some Gatorade at the turnoffs. Driving up, I couldn’t figure out where Mauna Loa was, then I realized it was the long low lump on the left. Not very impressive looking, although it’s the most massive mountain on earth. It’s 28 miles to the turnoffs and I couldn’t imagine riding this twice, so I fantasized about doing both climbs the same day. 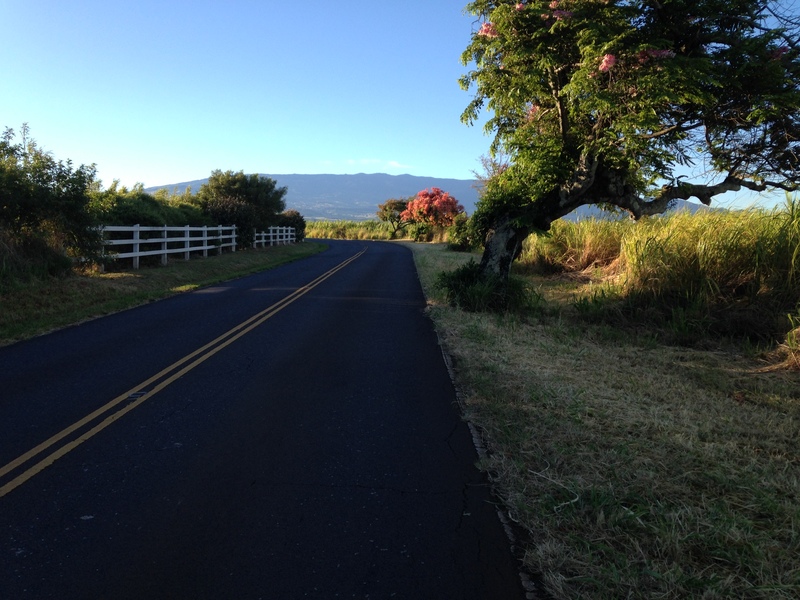 I decided to start with Mauna Kea as that is the shorter ride and easier to do, and I thought I might as well guarantee that I get one climb done. 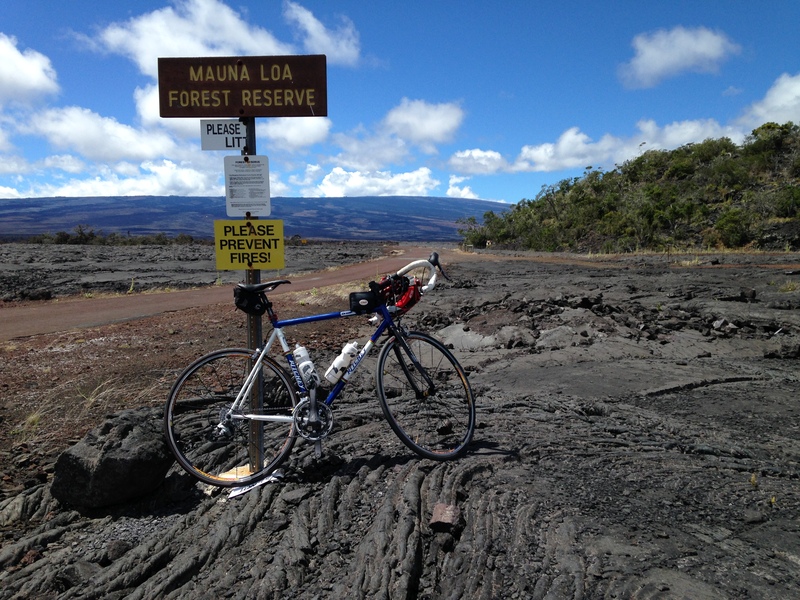 I started at the bottom of Waianuenue, and rode 28 tedious miles to the turnoff to Mauna Kea. Changing my mind from yesterday, I’d pretty much decided not to go for Mauna Loa because Summerson says it’s an isolated and unmaintained road, and I didn’t want to have bike problems 17 miles away from help. But I hadn’t completely decided, so there was always a chance. The listed climb finishes after about six miles from the turnoff, just past the Visitor Center where the road turns to dirt. I was glad to stop as it was gray and miserable. But it’s a disappointing place to stop, more than 4,000 feet below the summit of Mauna Kea. Summerson says “If and when the unpaved section is paved this hill may well become the world’s most difficult paved road climb.” The ride to the very top, including the dirt, is rated the number one climb on earth on climbbybike.com. Sadly, I suspect it won’t be paved for a long time, if ever. The dirt road prevents too many tourists from driving up to the observatories, because rental car agreements state that you are not allowed to take the car up the dirt road. But yes, what a climb it would be if it was ever paved. 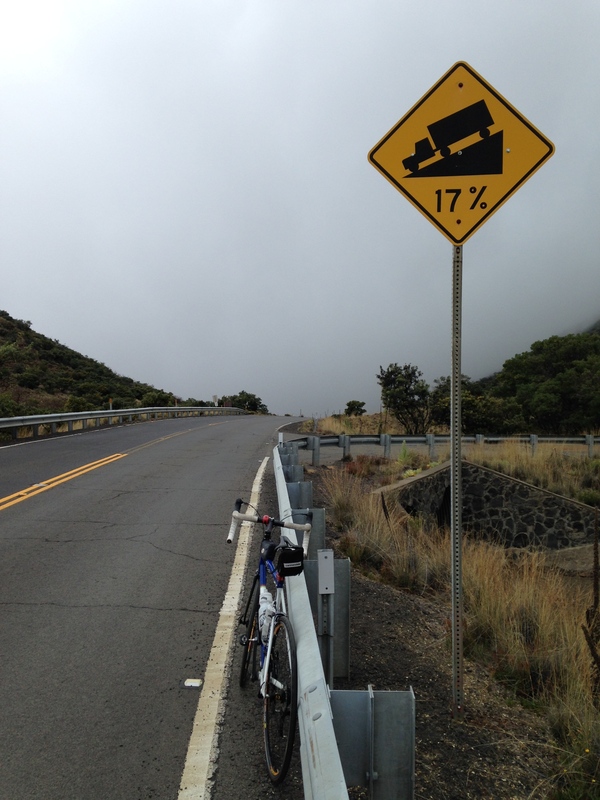 But the climb left me dissatisfied, unlike Haleakala. 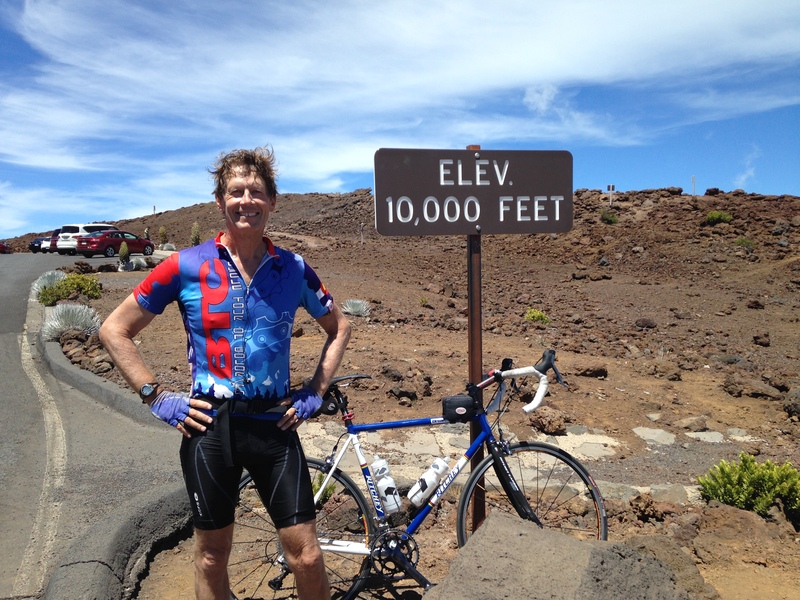 The tedious start and the fact that the paved climb finishes more than 4,000 feet below the summit of Mauna Kea. Of course, the clouds, drizzle, and lack of views didn’t help. This one I didn’t do, partly because of the weather and partly because I was intimidated. It’s about 17 miles from the Saddle Road turnoff, and it starts with a one lane road. Summerson repeatedly stresses that it’s isolated, and that the road surface higher up is not the best. I really didn’t want to have bike or tire problems that far out and was nervous about doing it by myself. Still, pleased to have done Mauna Kea, while riding back down I thought I might as well go for it. Unfortunately, when I got down through the clouds and rain, I saw that Mauna Loa was now shrouded in clouds. So that was that. There was no way I was going to ride the first 28 miles again – at least not on this trip, and not by myself. 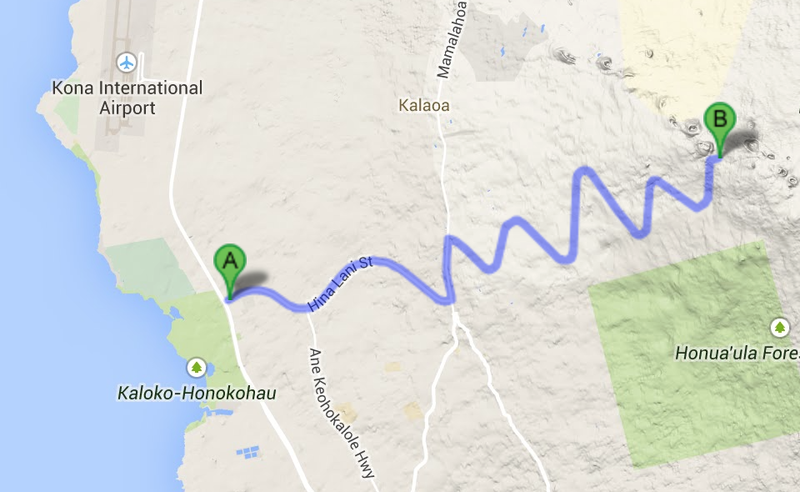 To do this ride I had to drive over Saddle Road yet again, going to Kailua-Kona on the west side of the island. I parked at the Home Depot near the bottom of Hina Lani Road and rode up Hina Lani, over some brutally steep sections to Highway 190. Left along this for maybe half a mile, then turn right up Kaloko Drive. This does 7 long switchbacks to the top. Most of the sections between the turns aren’t too bad, but the turns…. 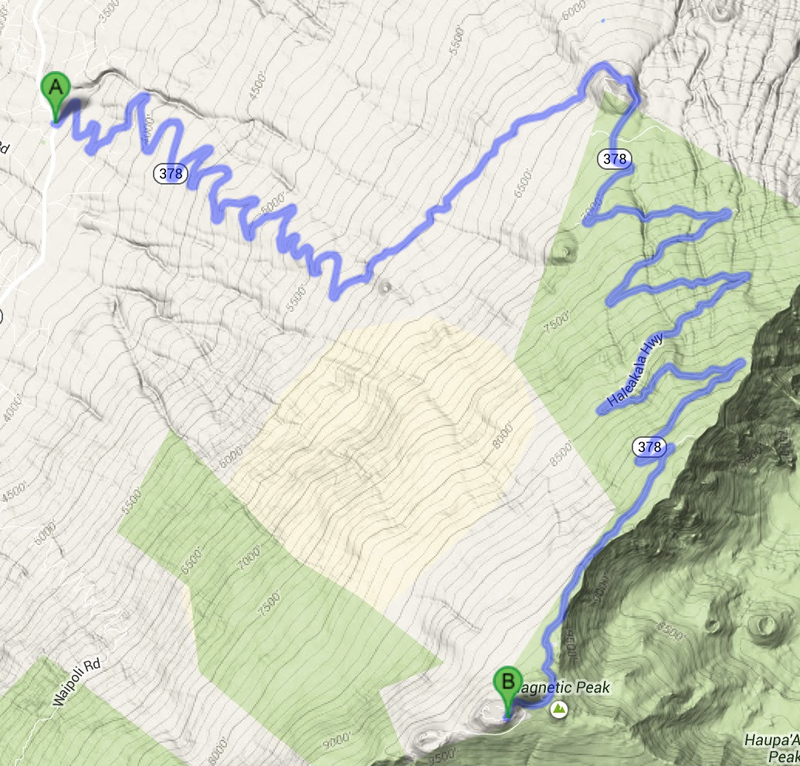 The turns are the hardest switchback turns I’ve ever done. Instead of the quick turn that changes direction immediately, these are slow, lazy, ponderous turns, spending far too much time going straight up the mountain. Which describes how I rode them: slow and ponderously, struggling with every pedal stoke. And if that wasn’t enough, the crux of the climb is the brutally steep last straight section up Huehue Road. The climb up Kaloko Drive goes through really lush terrain and the upper section is apparently a cloud forest. Fortunately there weren’t any major clouds when I rode it, although it was overcast. It’s a good hard climb, worth doing if you are on the island.